Venice is definitely my favourite city so far on this trip. 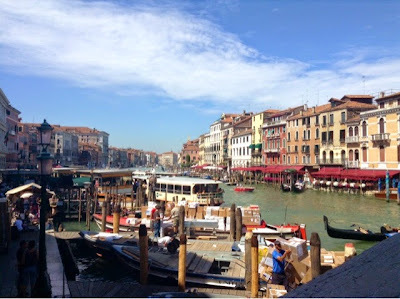 It's so different to anywhere else, with all the canals and narrow streets, and so beautiful. We took the ferry over first thing in the morning, and the ride was a nice way to start the day. We started in the Piazza San Marco, where the city's main sights are. 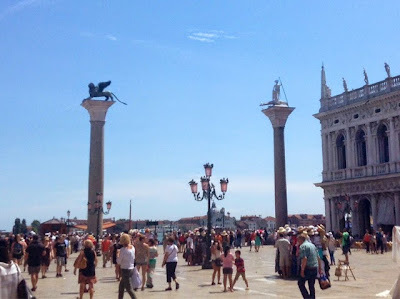 We didn't go in any, but got to see the Palazzo Ducale and the Basilica. 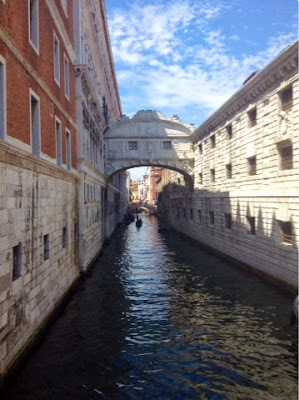 Our tour manager told us Venice is a city to get lost in, which is exactly what we did. It was nice to just stroll through the streets and look in all the shops full of beautiful masks, jewellery and Venetian glass. I bought a couple of masks and pieces of jewellery, and had to restrain myself from getting any more after that! We made it up to the Rialto Bridge, where there are even more shops and markets, and we stopped near there for lunch. It was the best meal we've had in Italy so far, dining on pasta and drinking bellinis. We also went for a gondola ride later as well, which was really nice, if a little shorter than expected. It was another thing unique to Venice though, so I'm glad I did it. We had a barbecue dinner back at camp, which was definitely one of our best on-site meals. We then got dressed up for a masquerade party that evening, and everyone looked really cool with their masks. Sadly the nightclub bar wouldn't open for us, so we had to stay in the other one, which wasn't ideal but we managed to have some fun anyway.